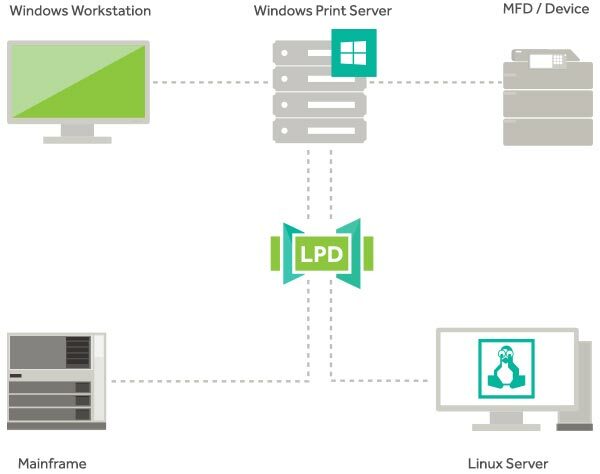 Administrators have long relied on Microsoft's implementation of the LPD protocol (Print Services for UNIX, TCP/IP Print Server, LPD Print Service and more) as a way of supporting applications and operating systems printing to Windows Print Servers. With Microsoft removing this feature from Windows Server 2012 onwards, PaperCut customers can continue using this protocol as a fully supported print solution. A Windows Print Server with a variety of clients and operating systems. Line Printer Remote (LPR) clients will be supported long into the future with the PaperCut LPD Service. Better yet, PaperCut customers who use LPD/LPR protocols will be able to benefit from PaperCut support for their end to end printing solution. Including installation, connection and examples, refer to the PaperCut LPD Service Knowledge Base article.